It wouldn’t be a Miami Hurricanes rivalry weekend if a three-game series didn’t go to the final game. The No. 8-ranked Canes traveled to Gainesville to take on the No. 6-ranked Florida Gators in the continuation of an epic battle between two Florida baseball powerhouses. The Florida Gators took the series 2-1. Against their first ranked opponent of the season, the Hurricanes (5-3) hung tough against University of Florida (UF) after a tough road loss to Florida Atlantic University (FAU) earlier in the week. In the three-game series, Miami fell in the heartbreaking opener, 4-3, after a walk-off single with two outs in the ninth by Florida’s Buddy Reed. Both Miami’s and Florida’s top pitchers were injured during the game, which led to a slow start on offense for both teams. Junior David Thompson carried the Hurricanes’ offense; he batted 2-for-4, including an RBI single and a run, and now leads the team with nine runs and seven RBIs. On Saturday, the Hurricanes bounced back hot. Sophomore Zack Collins blasted a three-run homer, his first of the season, and led the team to pick up a decisive 7-2 win. Miami scored in four of the first five innings of the game, giving junior left-hander Thomas Woodrey plenty of room to work with. Woodrey improved to a career-high 10-0 in his three seasons at UM, allowing just five hits over six 2/3 innings. 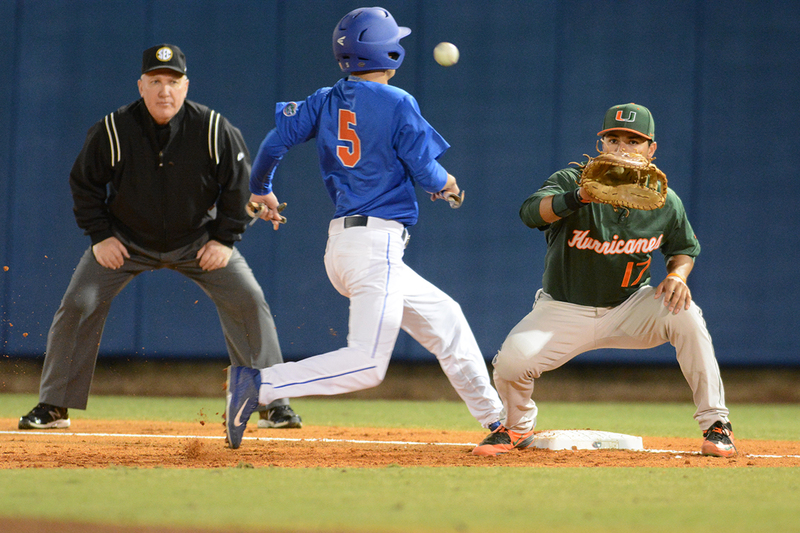 On Sunday, Miami took an early lead when junior George Iskenderian scored on a passed ball by Florida’s catcher. UF responded quickly with two RBIs in the third and fourth innings. Right-hander Enrique Sosa and Florida’s Danny Young duked out three innings of no runs for either team. Florida held off miami for the remainder of the game, winning 2-1. In the long history of these teams, Miami is 126-110 against Florida but 46-68 at Alfred McKethan Stadium. In the last two meetings, the Hurricanes and Gators split both series’ 2-1 and escaped with one series win apiece. With ACC play still weeks away, the Hurricanes have to keep momentum strong in out-of-conference contests. Two weeks of unranked opponents should give Miami the confidence it needs to take on conference matchups. The Hurricanes return home from a four-game road stretch and will take on Barry University at 6 p.m. Wednesday.